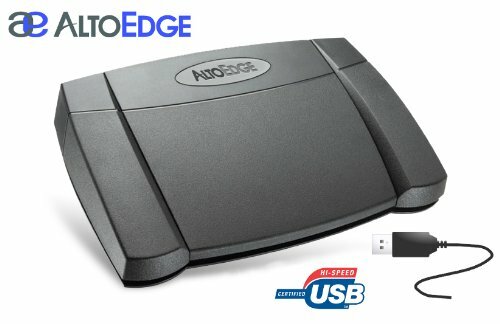 Engineered for the highest level of performance and comfort, the AltoEdge USB foot pedal is designed for transcription or dictation; it is compatible with most common digital transcription software applications that exist in the marketplace today. There are three pedal controls which are typically setup for Rewind (left), Play/Stop (center) and Fast-Forward (right). The ergonomic design of the AltoEdge foot pedal provides fantastic comfort great for all day use. Weighing in at 2.3 lbs, the foot pedal is just heavy enough to keep it in place while in use and the anti-slip backing helps ensure it stays right where you want it!